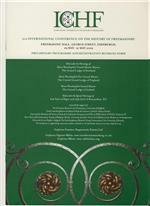 2nd International Conference on the History of Freemasonry. Freemasons' Hal, 96 George Street, Edinburgh. The overarching purpose of the conference is to illustrate and exemplify the wide range of study being undertaken on the History of Freemasonry, and will seek to advance further scholarly work in this area by providing an overview of recent work by those studying the subject . It is hoped that the conference will reinforce the advances already made in establishing the history of freemasonry as a distinctive field of historical research in its own right. The Burns Masonic Apron has recently been fully restored and will be on public display for the first time during the Conference. Pre Conference Concert. National Youth Orchestra of Scotland and Dinner, Freemasons' Hall, 96 George Street, Edinburgh. The Young Musician of the Year Awards will be held the evening before the Conference commences. Limited places are available. Welcome Reception, Freemasons' Hall, 96 George Street, Edinburgh. Gala Dinner, The New Club, 86 Princes Street, Edinburgh. The Lodge of Edinburgh (Mary's Chapel), 19 Hill Street, Edinburgh EH2 3JP. No registration necessery, all welcome.